– July 18, 2012Posted in: SusieQ FitLife Breaking News, SusieQ FitLife Updates! 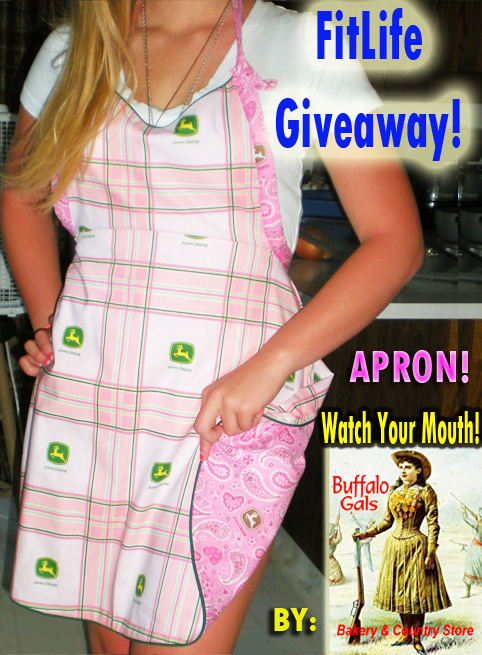 Put Your Apron On! It’s Watch Your Mouth Wednesday! Americans have become so accustomed to living in a Fast Food Nation; barley waiting 60-seconds to receive food in a bag while consuming the processed meal quickly (sitting in a drive-thru!). When shopping in a grocery store, people want to zip in & out without standing in a checkout line. People no longer have to chase, climb or hunt for their food these days; removing the physical aspect of working for a meal. The focus has also been removed from the food and onto a TV or computer screen! Whoa! Slow down there partner! The key ingredient in striving to “Get a FitLife” is to know your foods, “Watch Your Mouth”, sit down, enjoy it with your family, friends or kids and enjoy home-made meals. 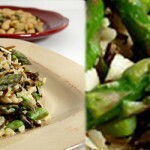 Healthier food choices are made when more time is spent on food preparation. SusieQ FitLife is about to make this goal more attainable with our FitLife John Deere Apron Giveaway by the Buffalo Gals Bakery! All you have to do is tell us how you are eating or cooking your meals in the comments section below in order to enter to win! America ranks higher in Obesity & Diabetes rates, compared to other countries like China, France and Turkey; where people spend more time, money and more than 74 minutes to sit down and enjoy their meals (according to the Organization for Economic Cooperation and Development). In the 1920’s when meals were made from scratch, women spent an average of 5.5-6 hours a day in the kitchen. The 1960’s, brought frozen TV dinners to the market with 35 minutes to spare. Microwavable dishes have people spending 27-15 minutes a day in the kitchen with very little to no food preparation with high sodium meals. 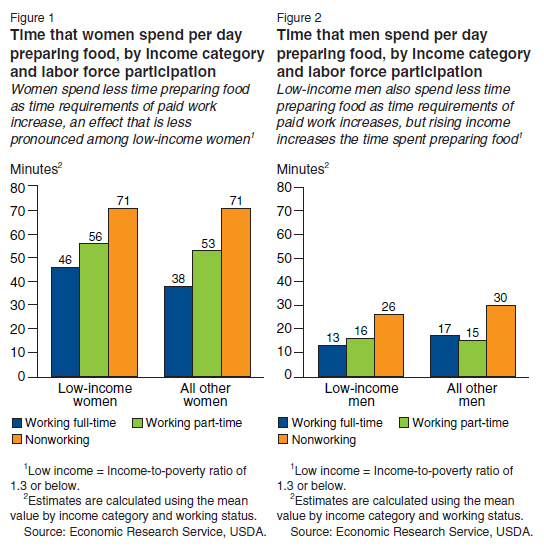 Women spend more time preparing food than men do. The higher the household income bracket, the fewer time is spent in the kitchen. Please see the Economic Research Service, USDA graph chart! Many people seem to spend more time watching cooking programs, rather than taking the time to prepare & cook meals. It takes more time to watch our ARMED Celebrity Chef, Carla Hall on ABC’s “The Chew” or the “Top Chef” type of “Hell’s Kitchen” Food TV shows. We need to take more control over the food items we put into our mouth by preparing them with our own hands! Abs & the quality of your FitLife are created in the Kitchen. Unfortunately more than a quarter of all meals & snacks are consumed outside the home. We need to incorporate the “slow food” principles of selecting, locally grown food from the Famers Market; while taking the time to enjoy the experience, texture & taste of our foods while eating meals mindfully! Here’s your chance to win your very own FitLife Gift from the Buffalo Gals! Tell us how you are eating or cooking your meals in the comments section for a chance to WIN! A winner will be announced next week on Watch Your Mouth Wednesday! Good Luck & Get a FitLife! Lisbeth Gomez Iam home—> iam in the kitchen…. love feeding my kids homemade food, they enjoy it tremendously and so does Juan . Susie Q has inspired me to eat healthier, with her daily post; and now the largest portion in all my meals are greens, whereas the smallest portion is carbs… Sacrifice-free healthy meal that fills us up completely! I spend way too much time in the kitchen, but I have to admit that I do use some convenience foods in combination with cooking a lot from scratch. Thanks to SusieQFitLife I was challenged to get back to a healthier life style. In “watching my mouth” I have enjoyed preparing meals from scratch again. Love adding more fruits and veggies to the plate and cutting back on the “prepared and processed packaged foods”. Being single and having a very busy schedule I found it “easy” to fall into the “instant” mode of microwave and fast food life style. Wanting to set a better example for the youth I volunteer with and to improve my own health I’ve started this new lifestyle journey with SusieQ. Knowing the importance of enjoying a meal with a “family” – I’ve started inviting kids and friends in to enjoy the meals around the table. We have a blast preparing the meals and enjoying them. Several added blessings have come from this. The kids and young families who join me are learning to prepare “healthy” meals and snacks from scratch. I’ve also had senior citizens join me who many times are alone for their meals. First — most of our precious senior citizens knew all about making foods from scratch and love sharing their wisdom with the younger generation in exchange for the oppurtunity to enjoy a meal around a table again. Our community churches have picked up on this and are now offering nightly meals to anyone who would simply like to enjoy a meal with other folks. We are also developing a fresh produce program to assist the lower income individuals in obtaining healthy food. I enjoy seeing this message and concern growing. SusieQ and our awesome First Lady Michelle Obama have inspired our youth with the Let’s Move Program and educating the youth on healthy foods and teaching them to plant gardens. The amazing cast on “The Chew” daily bring out the message of enjoying the family times at the kitchen table and also provide simple and low-cost meals. When I find myself alone for a meal — I simply prepare the meal and catch an episode of The Chew and read the SusieQ FitLife Page and I find myself surrounded by a sweet family! I have cooked from scratch for so long that the box would be too much time to figure out. One thing I reall try to do is make sure we eat something before we go out so we aren’t compelled to have fast food. I do stop at the grocery store and buy fruit and cheese if the kids get hungry. A very important thing in scratch cooking is to get to know your herbs and spices. People think it’s hard and takes a long time and it isn’t and it doesn’t. Here’s a great get to know your herb secret: when you are making tacos or seasoned meat don’t go for the packaged seasoning grab a bottle of Cumin. Add onions, garlic, salt, and pepper. So easy and you can add as much or as little as you like. I like to compliment my meal with lime rice. Grab a bag of whole grain or bown rice, and a lime. Put your rice in a pot, you don’t have to measure, add enough water to the pot so when you stick your thumb in the water comes to the first knuckle bend, bring to a boil, put the lid on and simmer till all the water is gone fluff with a fork and let sit with lid on for 5 minutes. It doesn’t matter if you have a cup of rice or a gallon of rice this method works every time. For every cup of rice add 1/2 tsp lime juice, 1/2 tsp of lime zest, and salt to taste. Grill some veggies and you have a wonderful meal. By the way, whole wheat tortilla’s are a breeze to make.